A maple sweetened butternut squash spread with warm seasonal spices like cinnamon, cloves and star anise. Fall is clearly in full swing in my kitchen. Apples are in abundance, an entire shelf in my kitchen has been dedicated to an ever growing collection of various pumpkins and winter squash, and that’s not to mention the copious amounts of cinnamon and ginger that have been finding their way into almost everything I make these days. The sweet and spicy smell of the season lingers sweetly in the air already. Thick and spreadable pumpkin butter embodies the tastes of the season and is a recipe everyone should have in their collection. Silky and velvety and rich with sweet warming spices, it’s like the best of pumpkin pie in a spreadable form. It’s also good on virtually everything. This is my take on the iconic spread, a naturally sweetened version made from butternut squash instead. The smooth and fairly fiber-less flesh makes it a wonderful substitute for traditional pumpkin with a clean delicate flavor and easy prep. Split, scoop, roast and it’s ready to use. While the butternut squash is doing its thing in the oven, maple syrup infuses with spices like vanilla, cinnamon and anise. 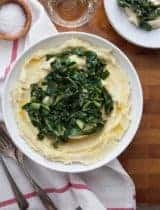 The two join forces along with a squeeze of lemon for some zing and simmer slowly on the stove until lusciously thick. 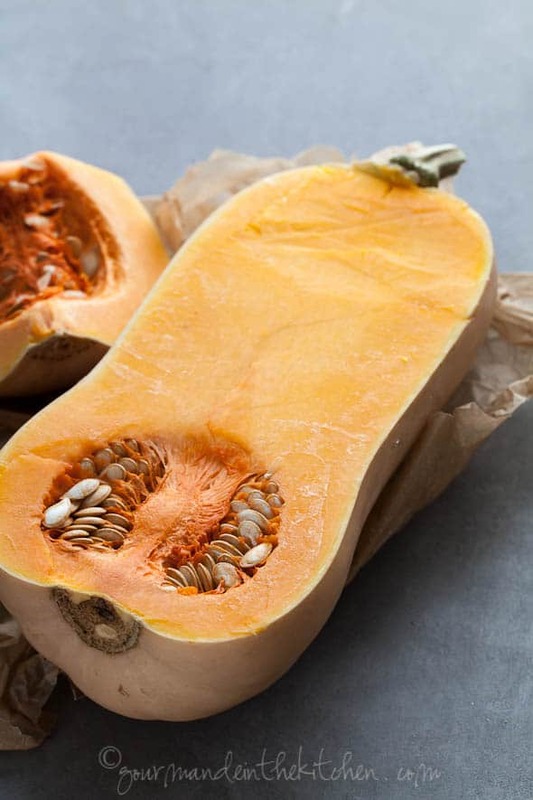 Smooth and creamy without a hint of cream or butter it’s rich with the concentrated flavor of squash and spice. However you choose to use it, this maple squash butter may fast become your new fall favorite, and since it’s the season of giving and receiving may I suggest you double the recipe and make an extra jar for a friend? 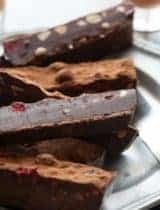 Stir it into a latte or hot chocolate. Swirl it into homemade ice cream. 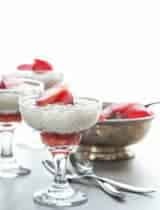 Dollop it over yogurt or in parfaits. Blend it into cake or muffin batter. Use it as a dip for fresh fruit. Eat it straight from the spoon! What do you like to put pumpkin butter on? 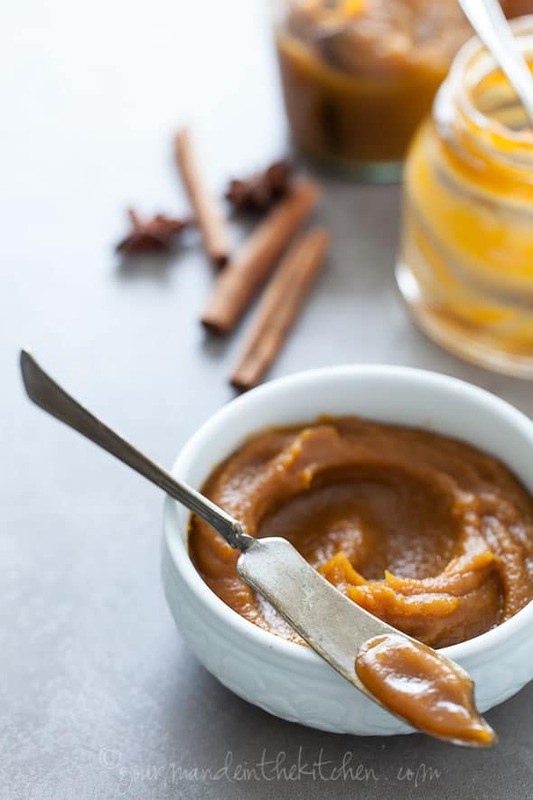 A riff on traditional pumpkin butter, this maple spiced butternut squash butter is easy to make and naturally sweetened. Place butternut squash halves on a large baking sheet with the cut side down. Add a few Tablespoons of filtered water to the bottom (this creates steam as it roasts). 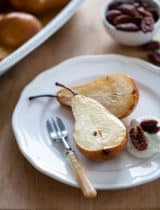 Place a piece of parchment over the squash, then cover with a aluminum foil and seal around the edges of the baking pan. Roast the squash for 60 minutes or, until the flesh is tender when pierced with a fork. Set aside until cool enough to handle. In the meantime heat the maple syrup with the cinnamon stick, halved and scrapped vanilla bean and anise star in the bottom of a medium saucepan and bring to a simmer. Cover, turn off heat and let infuse while the squash cooks. Once the squash is cooled strain the infused maple syrup into the bowl of a food processor reserving the whole spices. Scoop out the squash flesh and add it to the infused maple syrup in the bowl of the food processor . Add the ground cinnamon, cloves and lemon juice and puree until smooth. Pour the mixture back into the saucepan along with the reserved whole spices. 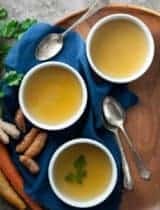 Bring to a simmer and reduce heat; cook, uncovered, over low heat, stirring frequently, 20 to 25 minutes or until thick (it may spatter so keep an eye on it). Remove from heat; ladle into jar (I leave the whole spices in there so they can continue to impart flavor after jarred but you can fish them out now if you prefer). Cover; let cool to room temperature and store in refrigerator for a few weeks or the freezer for up to 6 months. Disclosure: This post contains affiliate links. Find out what that means for you here. I was thinking that too--package it up in some cute little jars and it would be a great (and healthy!) gift! Oh, my! I have a jar of store-bought pumpkin butter that I spread on toasted bagels and stir into my slow-cooker oatmeal. Will be making your version soon! How beautiful is that squash butter! I might have to make some low carb bread just to put it on. OMG Sylvie that looks fantastic! I am a sucker for pumpkin pie spice flavours, and we harvested over 40kg of butternut alone from our allotment last month (not even counting the pumpkins...!) so I am definitely in the market for recipes to use them up! Such a great use for butternut squash! I too, have been collecting squash. I now have 2 entire shelves in my garage holding all types of winter squash! I can just imagine the amazing aroma of this squash butter as it bubbles on the stovetop! I would slather it on everything. Wonderful butter, I'd love to spread it on homemade bread! What a great butter recipe! I want jars and jars! Sylvie, I love the idea of pumpkin pie filling in spreadable form. 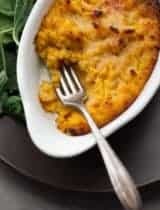 Butternut squash is one of my favorites and I find it substitutes perfectly for pumpkin in so many recipes. Stirring it into hot chocolate sounds like a fun idea too! A autumn spiced butter with butternut is a fabulous idea! It may be a secret, but butternut squash has a much better flavor and texture than most pumpkins I've tasted! 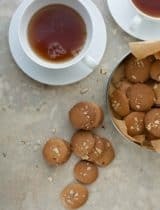 Beautiful pictures and the recipe sounds delicious. I just signed up for the Online Food Blogging Conference. I look forward to your segment. Wonderful, I hope you enjoy all the presentations! This squash butter looks heavenly. I love that it's free of refined sugar too! The pumpkin butter I saw at the store had high fructose as the second ingredient. Yuck! Thanks for sharing! I love your recipe and that's it's made with maple syrup. When I roast a butternut squash, I put the whole thing in oven. The skin just nearly pulls off and it's easier. I find the butternut squash so hard to cut. 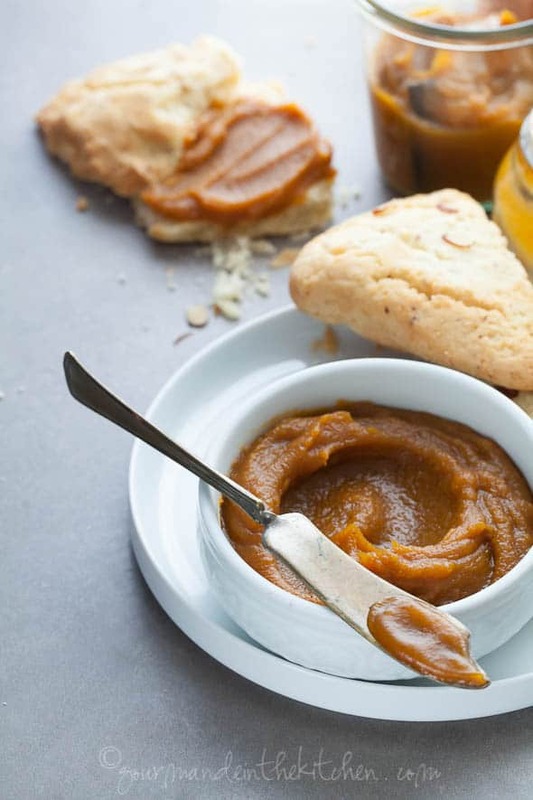 I love, love pumpkin butter and have often wondered about making it with other squashes! I love it on toast, but really I love it in a French 75 cocktail. My favorite for Halloween and Thanksgiving! This is beautiful. My husband loves pumpkin butter, so this would be a fun way to change it up. A great way to use maple syrup. It's a unique spread and yummy spread for some good bread. We have just gone through a massive purge of all our apple/sweet potato/etc butter in our cabinets. I think we need to fill it up with some squash butter now! oh i would love a dab or rather slab of this on my bread or anything for that matter! LOVE IT! Oh goodness, this spread sounds wonderful :) my husband will love it! 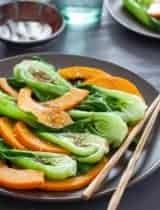 Would acorn or carnival squash work in this recipe? Any squash would work but that being said I think that the richer flavor and smooth texture of butternut squash would be best here best if possible. Can this recipe be canned for shelf life via water bath or pressure canning? Thank you. Hi Kathy, I haven't tried it but my concern would be that the sugar level wouldn't be high enough here to prevent bacterial growth for canning purposes. This is best kept in the fridge. Made a double batch of this last Sunday. This is only the second time I've worked with butternut squash, and the first time was years ago when I first started learning to cook. This time was far easier. lol Though to be fair, I didn't have to peel the squash this time... Anyway, I replaced the vanilla bean with 2 tsp of homemade vanilla extract (added it to the food processor) due to not wanting to spend $15 on a single bean. I highly recommend reducing the butter in a large pot, since mine (in a smaller pot) burped and spat everywhere if I wasn't constantly stirring. It turned out amazing, though. I don't really like licorice, so the smell is off-putting, but it tastes INCREDIBLE on a peanut butter sandwich. It's so light, yet richly spiced and balanced in flavor. I just finished off a big batch of crock pot pumpkin butter, and it's interesting how the two compare. Thanks so much for the recipe! Glad to hear that you enjoyed it!